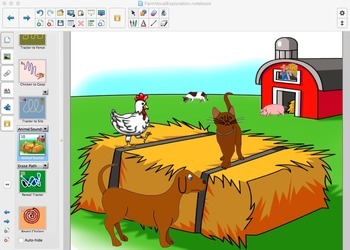 This fun little tool helps your students explore their voices in an engaging farm-themed environment. 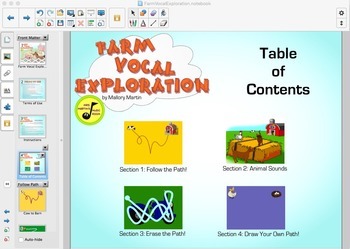 Vocal exploration is a vocal warm-up that helps students engage their head voice and explore different vocal sounds they can make. In addition, it reinforces skills such as left to right tracking, abstract music notation, pitch, solo experience, and creation/composition. Every music class and choir rehearsal should begin with some vocal warm up, and this file is a great addition to your toolbox. It will help engage every student in the room. Plus, it's just plain fun! This product is provided in SMARTNotebook format. 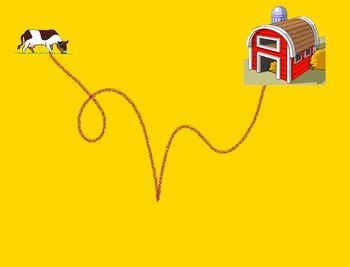 The slides are interactive and involve use of the finger, pen, eraser, and include sound effects. 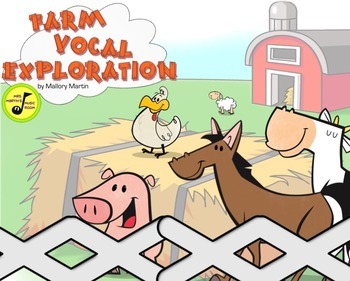 I hope you enjoy Farm Vocal Exploration! Please return to Mrs. Martin's Music Room to rate and review this product. Every review you write helps improve the quality of products on TeachersPayTeachers.com and earns you credits toward future purchases! This product is copyright (c) 2015 Mallory Martin. No copying of any sort is allowed. Multiple licenses are available for sharing this product with others. Clip art is from Anchor Art Man, Creative C, and Cosmic Dog Designs.